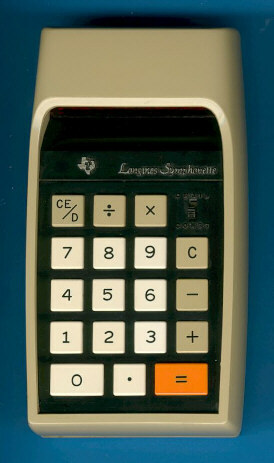 We expect that about 18,000 Longines Symphonette Version 1 calculator were sold in the olive-green housing. All Version 1 models with serial numbers above D1000-18000 use the standard housing known from the Texas Instruments Datamath calculator. This Longines Symphonette with one of the highest reported serial numbers (D1000-20495) looks very familiar to us. Dismantling this late Longines Symphonette Version 1 calculators reveals an expected manufacturing date of February 1973. Texas Instruments introduced the Datamath Version 2 in February this year, too. © Joerg Woerner, March 6, 2004. No reprints without written permission.